There are a lot of automotive brand names that stir the blood, but just a handful of boats. Haines Hunter is one of them. 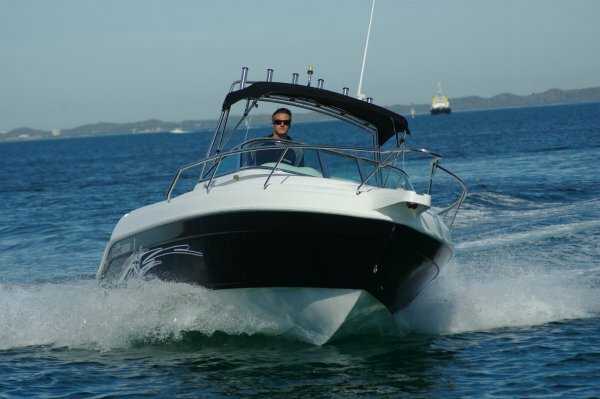 They have the pedigree and the mystique, they all have hulls happy to work on the ocean, few fishermen ever found fault with them, and, to show the builder’s confidence in his product, they carry a seven-year hull warranty. 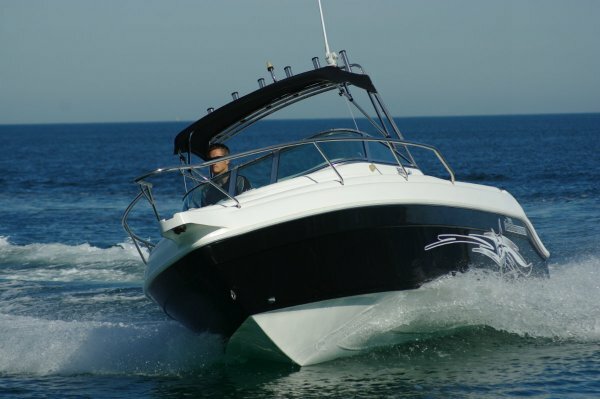 They are all recognizable at a glance, too; certainly the review 600R stood out at the ramp – partly probably because the hull featured a lot of black gelcoat, which seems to be a minor trend. Like many Haines Hunters its profile suggests a runabout, but the truth is the 600R is a cuddy. 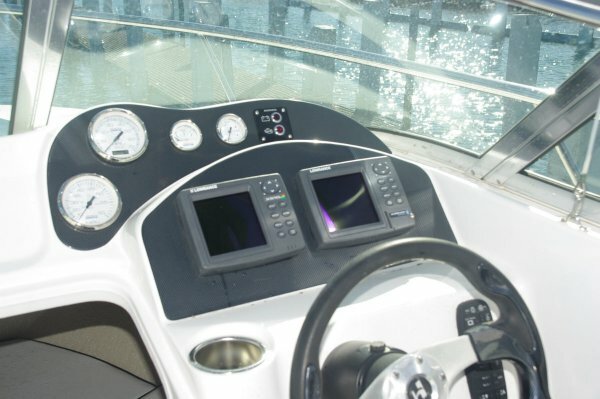 The boat’s emphasis is on the cockpit, but the cuddy still gets useful length and headroom; perhaps not a regular sleeper, but the occasional doss, and shelter anytime are within its capabilities. It also houses the chemical toilet in a dedicated compartment. All very handy, but dedicated Haines Hunter users are interested in what lies aft of the bulkhead: fairyland for the angler. It starts with an exceptionally high coaming that contacts the body close to its centre of gravity, and has recessed cleats to minimize snagging. Below are pockets on two levels for all the small junk we take to sea, the lower level also containing racks for rods and gaffs. Half a dozen more rods find a home in the Targa’s rocket launchers, and more in the coaming’s sockets. 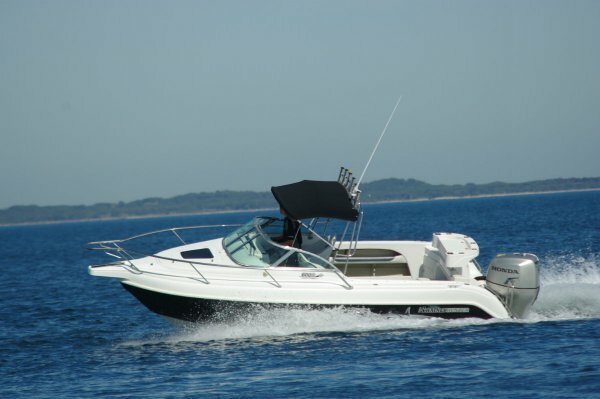 The Targa, whose main job is to carry the Bimini, readily folds to give maximum overhead space for rod work. In position for the voyage out, this structure with the addition of clears makes a near weather-tight driving position. The review boat also had storm covers aft, which are useful on long road hauls or in storage to keep dust out of the boat. The removable bait station is a grand structure with lidded compartment, cutting board, more rod sockets and combined sinker cups-drink holders. The transom houses the complementary live bait tank. The catch tank, a big one, is also long and relatively narrow, the kind for serious fish. For those who treasure easy cleaning beyond comfort underfoot, the cockpit carpet unclips for removal on purely fishing days. It takes about 30 seconds to replace it and make the family happy. The rear lounge is standard Haines Hunter, folding into the transom and disappearing to order. Alongside it to port is the clever transom door. This is a horizontally hinged piece of transom that drops down to form a step. The driving position with a pair of pedestal seats, and curved windscreen ahead, is first class. Eye and hand fall naturally to displays and controls, and vision is ideal: stand –holding on to the full width bar at windscreen top – and you are way above the windscreen; sit, in considerable comfort, and your eye line is mid glass. The dash is neatly laid out and features the advanced electrical system of all of the larger Haines Hunters. This eliminates fuses, provides waterproof keypads and electronic circuit protection, and a host of other goodies. 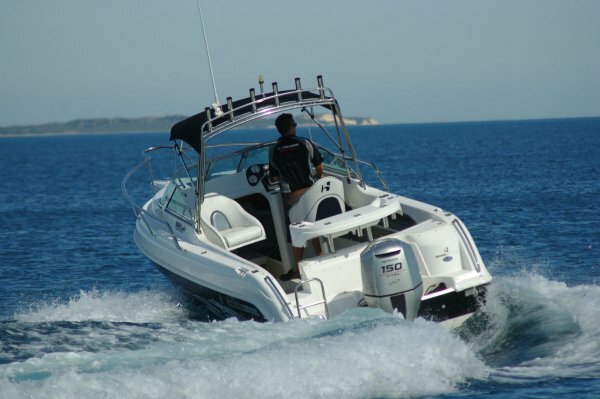 The 600R is rated up to 230hp, which is considerable for a hull weight of 1150kg, the 150 Honda on our boat being closer to the norm for a 20-footer. It was also better than adequate, delivering a top speed well up in the 30s. This means a cruising speed of pretty well whatever you want with reserve power for heavily laden days. Hydraulic steering is standard, and having once tried it no one would want to go back to cables. 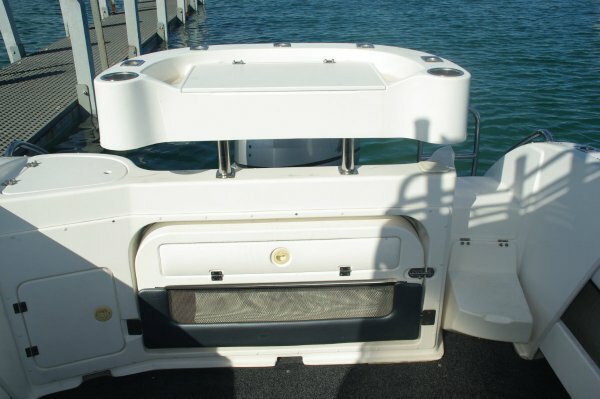 With the clears in place access forward via the narrow side decks is difficult – there is a lack of secure hand holds, which is true of most soft tops. Fortunately the clear, flush fore hatch is in the right place for a standing person to handle ropes or anchor. 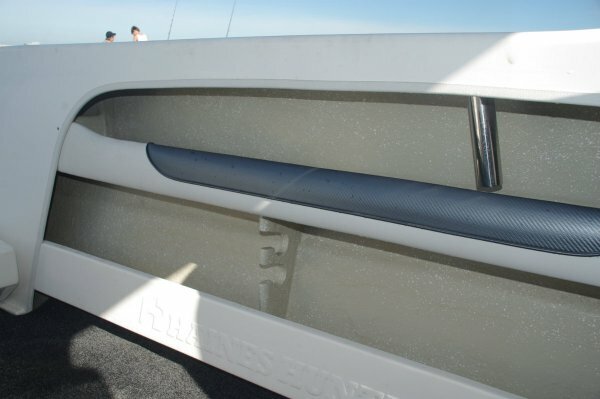 The cable locker lid is flush too, typical of the developed state of the boat’s mouldings: nothing on board seems an afterthought. Which sums up the 600R: it has been thoroughly thought out.